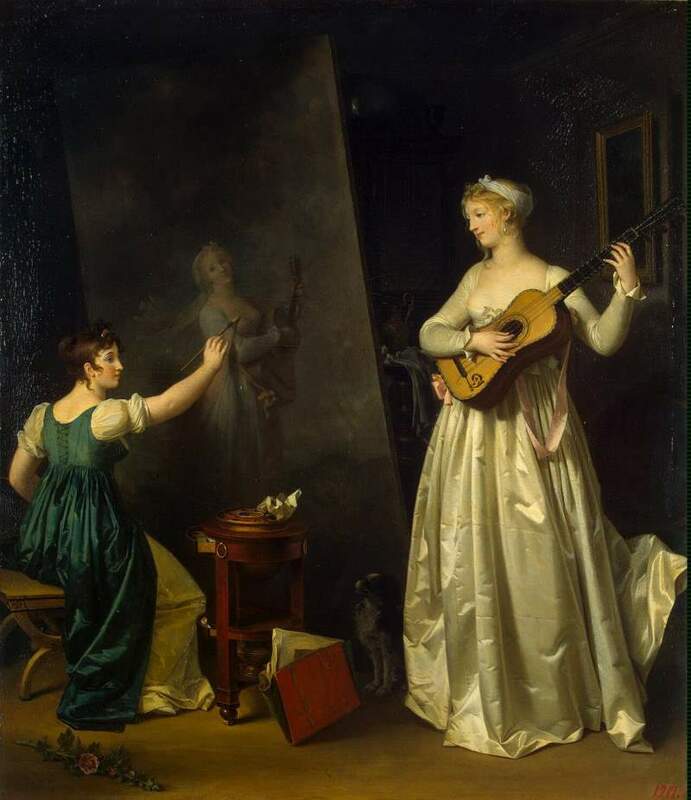 Marguerite Gérard: “Painter when painting a portrait of a lute player”. 61 x 51.5 cm, before 1803. 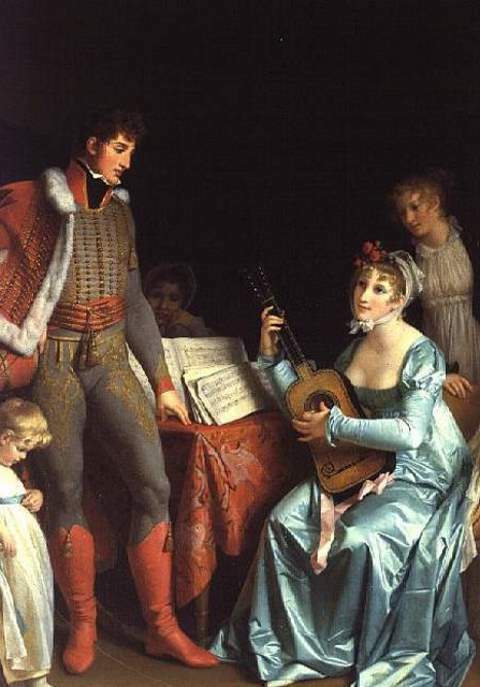 Marguerite Gérard (28 January 1761 in Grasse – 18 May 1837 in Paris) was a French painter and etcher. She was the daughter of Marie Gilette and perfumer Claude Gérard. At 8 years-old she became the sister-in-law of the popular Rococo painter Jean-Honoré Fragonard, and when she was 14, she came to live with him. She was also the aunt of the artist Alexandre-Évariste Fragonard. Gérard became Fragonard’s pupil in the mid-1770s and studied painting, drawing and printmaking under his tutelage. She appears to have executed five etchings in 1778 in collaboration with the master. She never married and apparently never demonstrated any interest in joining the Academy, but had a tremendously successful career. She won three medals for her work, which she exhibited regularly once the Salons were opened to women in the 1790s. Her pictures were acquired by luminaries such as Napoleon and King Louis XVII, and she acquired considerable wealth and real estate. Her interest in art was shaped by her brother-in-law Fragonard, beginning in 1775, when she moved from Grasse to Paris to live with her sister’s family. 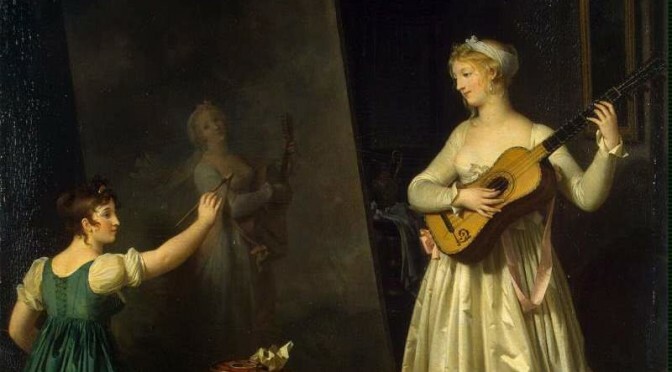 As part of the Fragonard household, Gérard had considerable financial freedom, along with the opportunity to further her artistic training as her brother-in-law’s unofficial apprentice. By her mid-20s, Gérard had developed her signature style, which featured painstakingly accurate details rendered with subtly blended brush strokes, both traits borrowed from 17th-century Dutch genre specialists, notably Gabriel Metsu. Gérard’s work is technically impressive but also practical: these relatively small-scale, portable canvases appealed to wealthy collectors who preferred to display in their homes meticulously painted still lifes and genre scenes rather than large history paintings. The numerous engraved versions of Gérard’s paintings made them accessible to less affluent art lovers and helped increase her reputation. La duchesse d’Abrantès et le général Junot (Duchess of Abrantès and General Junot), oil on canvas, ca. 1800. Jean-Andoche Junot, 1st Duke of Abrantès (24 September 1771 – 29 July 1813) was a French general during the Revolutionary and Napoleonic Wars.